Why should you support Cal Poly sports? With finals week fast approaching and pressures mounting, Cal Poly students are beginning to resent their school. But this is not the attitude to have going into your tests. 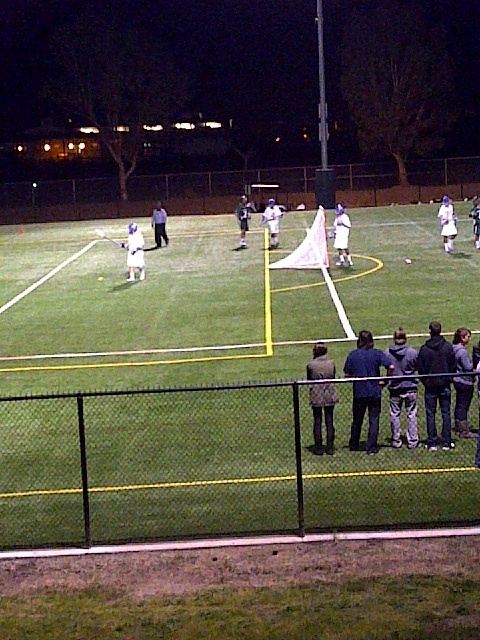 School spirit and pride is important, and what better way to show it (and gain some of it) than supporting those who participate in Cal Poly sports? “Schools with large fan bases tend to create a competitive atmosphere where students feel like they are part of a movement of pride that their whole school is behind,” Kacey Held, a freshman civil engineering major said. Held plays forward for the girl’s soccer team. Going to games is also a fun way to spend an otherwise boring night, or weekend day. Not only are you having fun and being social, but also you get out of your room into the open air/gym. Putting off those annoying studying hours isn’t so bad either. 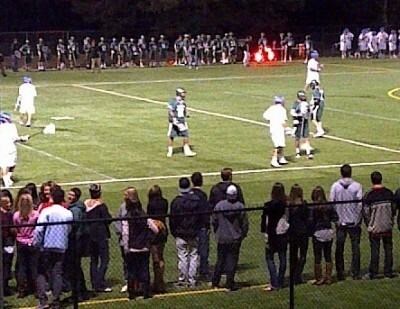 Large crowds make the game more exciting for players, but it also makes the game more fun for spectators. The environment is infectious; when you’re surrounded by a rowdy crowd you can’t help but cheer until you’re hoarse (a close game helps too). Of course, you participation doesn’t have to end at cheerleading. Students who don’t make the school teams can choose to join club or intramural sports. – Baseball v. Valparaiso at Baggett Stadium 6 p.m.
– Men’s Tennis v. UC Riverside here 1 p.m.
– Baseball v. Baseball v. Valparaiso at Baggett Stadium 6 p.m.
– Men’s Tennis v. UC Irvine 12 p.m.
– Baseball v. Valparaiso at Baggett Stadium 1 p.m.
Recap: why should you go? This poster, advertising the upcoming Harry Potter event, is found in the UU, just outside of Starbucks. November 19, 2010 was an epic day in the lives of hard-core Harry Potter fans, and July 15, 2011 will be even bigger. But, July is still a five-month wait (not including February). What are fans to do during this time!? Associated Students Inc. (ASI) solved the problem. 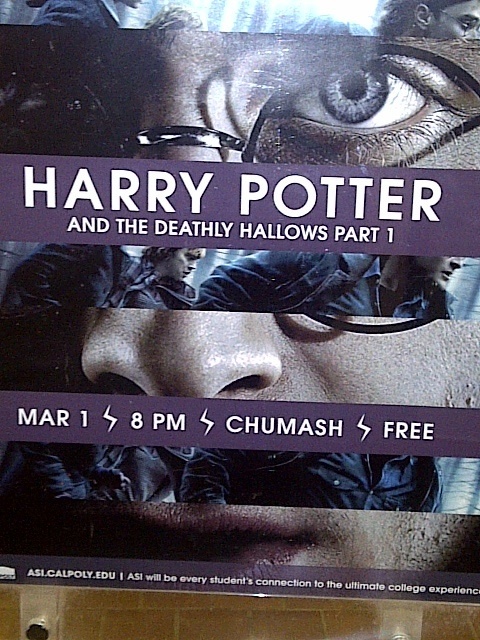 This Tuesday, March 1, the Chumash Auditorium will be showing Harry Potter and the Deathly Hallows, Part 1, free for students at 8 p.m.
Why should HP fans be jumping for joy at this news? Because this very well may be your one chance to watch Deathly Hallows before the DVD hits shelves, which isn’t until April. So why not wet your HP appetite for now, because we all know there is no way to watch it online or anything (cough, cough). “I’m excited for the contest. I’m so gonna win!” Lauren Granados, junior nutrition major, said. ASI is also putting on a “#1 Harry Potter Fan Contest.” Contestants just have to post a video on youtube explaining why they are the biggest fans. The top three will receive prizes during the event. “I want to Dobby’s beautiful face one last time.” Cassie Pate, freshman biology major, said. The Chumash Auditorium is on the second floor of the University Union, by all the chairs that point toward the flatscreen TV. The Auditorium houses many of ASI’s events. 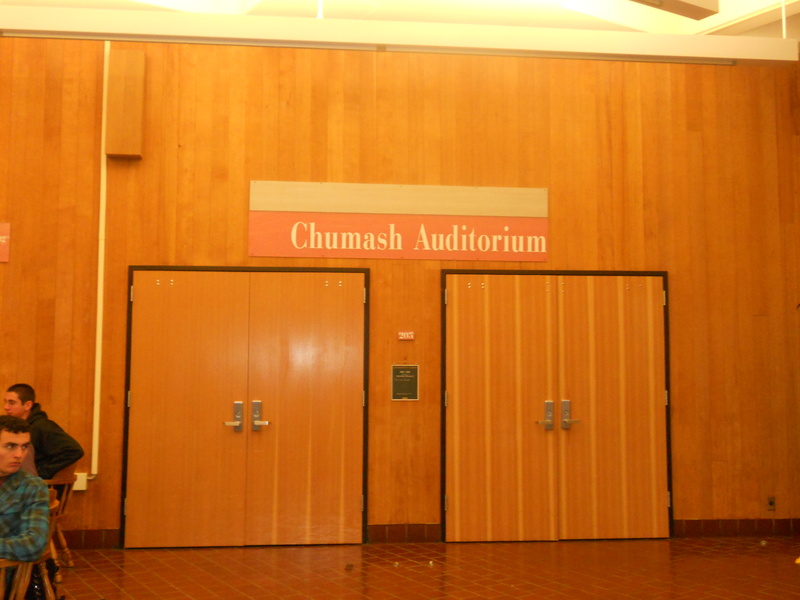 The Chumash Auditorium, located in the University Union (directly above Starbucks), houses many ASI events, from career fairs to dances. It’s huge, with a maximum capacity of 996. Anyone can schedule events, as long as they go through the right channels, like ASI or the Performing Arts Center. So, lets, recap: Why should you attend on Tuesday? It will be a while before the DVD is released and even longer before Part 2 hits theaters, so why not get a HP fix in now? Just BTW: The DVD and Blu-ray of Deathly Hallows, Part 1 will be released on April 15. The 3-Disc Blu-ray Combo Pack (meaning it has a DVD, Blu-ray, and Digital Copy) will include multiple features, including a seek peak at Deathly Hallows, Part 2. The DVD will be a single disc, and will only have additional scenes. The Combo Pack will go for $35.99 while the Single Disc DVD will cost $28.98. Different theaters offer different experiences. Some prefer giant rooms with lots of people, while others like more intimate, even old-fashion settings. The map below plots eight theaters in San Luis Obispo City and Arroyo Grande, varying from movie theaters, playhouses, and a drive-in. One is solar powered. 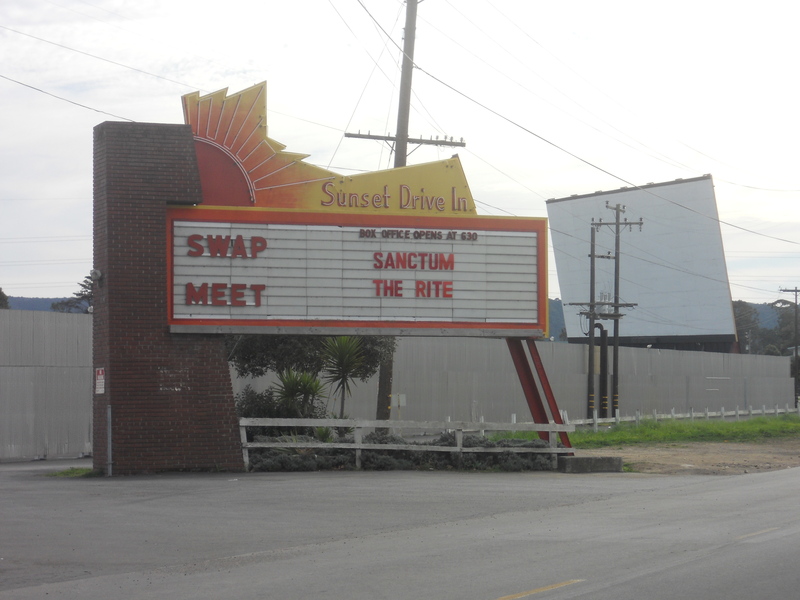 The Sunset Drive-In looks run-down in the daylight, but at night the ambiance changes. And the telephone polls can not be seen while viewing a movie. From its giant projection screen to the snack bar in the middle, the Sunset Drive-In, located in San Luis Obispo, provides an old-fashion setting with new-age movies. “It has a nice ambiance,” Tom Booth, fourth year wine and viticulture major, said. “The effect of the projection illuminates the area very nicely. Its just a very cool setting, especially between the twilight and total night hours.” Well the facility looks pretty rundown in the daylight, the night changes its appearance to a typical, intimate drive-in. The Drive-In is open every night of the week. Drivers simply pull into the lot, pull up to the ticket window, and buy a single ticket for both shows. The driver than parks in a space, whether forward or backward, depends on what car you have. 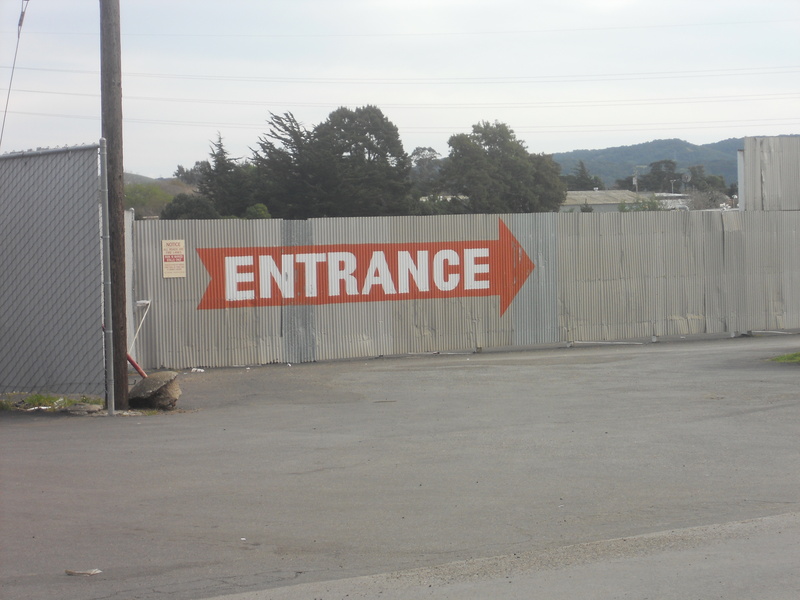 At night the entrance can be confusing. Luckily, there is a giant sign to help driver out. This route leads cars directly to the ticket booth. Theres an illuminated path that guides cars to parking spaces too. “I like the drive-in cause I can back my truck into a parking space and lay down in the bed. With a blanket its not too cold.” Robert Garcia, second year agriculture major, said. Be wary if you have a questionable battery, however. To listen to the movie, viewers tune into a special station just for Sunset. This requires must cars to be on during the entire double feature. Perhaps jumper cables would be a good idea. The Sunset Drive-In’s website tells what movies are playing that night. The Drive-In shows a double feature every night. The movies change every week. “It’s the best deal in town.” Booth said. Both movies cost $7 for an adult and $2 for a child (ages five to eleven). “And they serve Vanilla Coke.” Booth added. Also on the website is a phone number. Calling it leads to a recording with the latest Sunset news. Every Saturday is Super Saturday when the Sunset area holds a swat meet; $20 per space. The Sunset Drive-In is located at 255 Elks Lane. Remember, if you’re driving and using a map, watch out for that first right turn. It’s a little evasive and missing it causes for a very frustrating adventure. Repelling down a cliff. Looking down, hundreds of feet below, jagged rocks threaten to end my life. My only savior, a rope tied to my harness. Or at least that’s what it felt like. 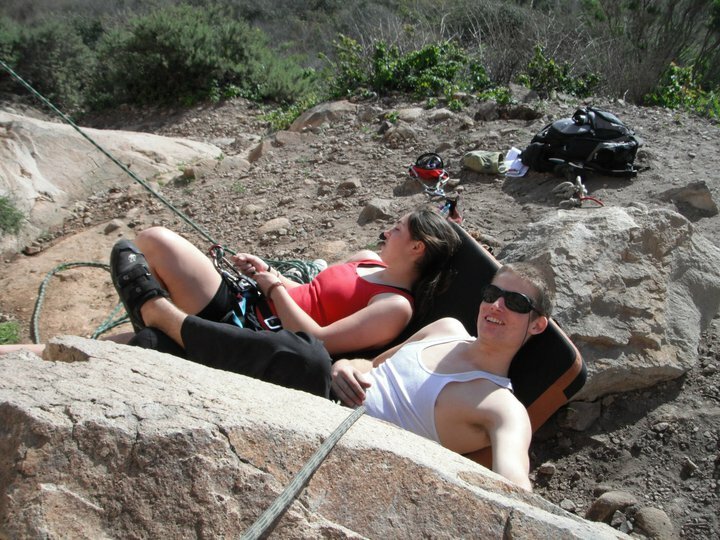 Really, we were climbing in Cabrillo, (at Rock Land, more specifically) which is about a 30-foot-tall rock. 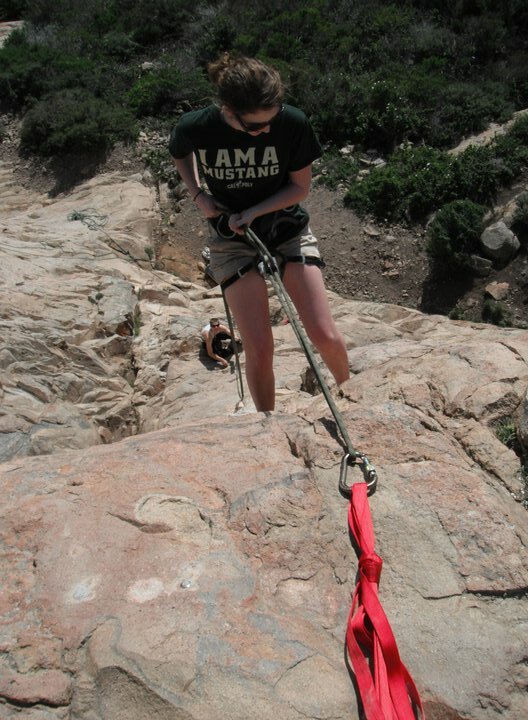 The rope was strapped to some bolts on the rock and the ground below was actually pretty smooth. But, for a beginner, these images warped to preview a tragic accident. Why did I go rock-climbing, since I’m such an obviously cool-and-collected individual? Well, climbing was my latest blog topic, an audio recording of some climbers in action and their thoughts on the sport. However, to get the interviews, I was given an ultimatum; “Only if you (me) come climbing too,” Peyton Burns, first year civil engineer, said. “(Rock climbing is) defiantly a place of encouragement. You take people out for first time and its not like ‘Oh you’re not as good as someone else.’ It’s you’re all out here having a good time.” Tiffany Safronoff, first year civil engineer and PolyEscapes employee, said. According to Sarfronoff, when climbers run into other climbers on the rocks, they are instantly friends. She said they’d talk for about 10 or 15 minuets, do a climb together, than ask what each other’s names are. Dan Schricker and Peyton Burns belaying for other climbers. Belaying is basically keeping the rope secure for the other person and letting out slack when needed. Also, if the climber falls, the belayer can “break” and catch the climber with the rope. As previously stated, the whole reason I did this was to get an audio interview. Unfortunately, getting audio at a rock is a little challenging. For one, there’s no really even place to put a recorder besides a really flat rock or the dirt. Second, its hard to interview someone when both of you have both hands and feet in teeny tiny cracks. And third, there’s a lot of wind up there. So, instead I made sure to get plenty of ambient and natural noises from our spot, and my interviewees/partners and I agreed to complete the interview back in their dorm room. Therefore, my 1-2 minuet audio tack actually took me an entire Saturday to collect. This is a view of the marshes from the top of the rock. The mist began rolling in as it got closer to sundown. Oh, and a few more words of advice for you potential climbers out in SLO county; BEWARE OF POISON OAK! 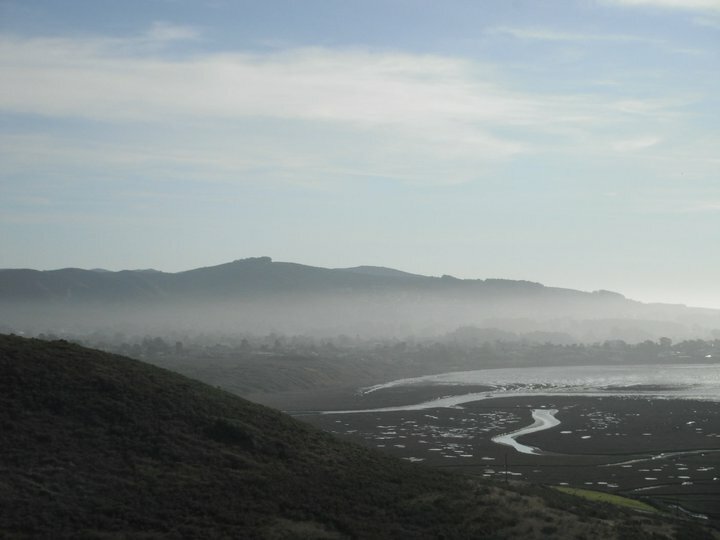 In order of appearance, Tiffany Safronoff, Dan Schricker, and Peyton Burns describe what they have learned about rock climbing around SLO county. See a video of this amateur and Dan Schricker climbing at Bishops! You know something going on????? Know of something fun or cool going on around SLO? Want it blogged? Let me know through twitter or leave me a comment!